The NIH’s National Cancer Institute (NCI), has begun expanding the Lung Cancer Master Protocol (Lung-MAP) to include patients with all forms of non-small cell lung cancer (NSCLC). Lung-MAP previously tested treatments for people with advanced stage squamous cell lung cancer. By opening the trial to all types of advanced stage non-small cell lung cancers, the NCI reasons, thousands of new patients will be eligible to enroll in the landmark trial, and can benefit by taking new investigational drugs to fight their cancer. 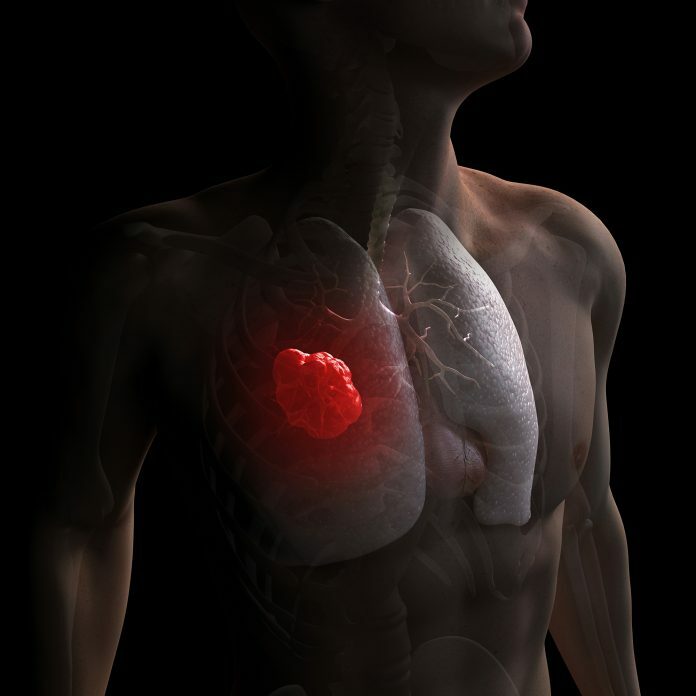 “Checkpoint inhibitors have produced a major advance in this refractory cancer, and Lung-MAP now intends to build on the success of these immunotherapy agents by adding new agents to further increase the effectiveness of this approach,” Meg Mooney, MD, MBA, acting associate director of the NCI’s Cancer Therapy Evaluation Program, said in a statement. The new trial will address questions about the efficacy of immunotherapies and immunotherapy combinations and the validity of new biomarkers. To date, the NCI said, Lung-MAP has also produced critical insights into the conduct of large-scale precision medicine trials, including tissue sampling and banking, genetic screening, and patient communication. In addition to Dr. Papadimitrakopoulou, the study team also includes Roy Herbst, MD, PhD, of Yale Cancer Center; David Gandara, MD, of University of California, Davis Comprehensive Cancer Center; Mary Redman, PhD, of Fred Hutchinson Cancer Research Center; Fred Hirsch, MD, PhD, of the University of Colorado; and Philip Mack, PhD, also of UC Davis Comprehensive Cancer Center. Lung-MAP is the first precision medicine trial in lung cancer supported by the NCI, and the first major NCI cancer trial to test multiple treatments, simultaneously, under one “umbrella” design. A new screening protocol to include the addition of liquid biopsies, as well as a streamlined informed consent form that combines screening and prescreening. The change will make it easier to enroll patients, according to the NCI. Plans for two new drug sub-studies scheduled to open early this year—one testing a PARP inhibitor and another testing a PD-L1 and VEGF inhibitor in combination scheduled to open in early 2019. Two more sub-studies are in development, and are set to launch in late summer 2019. A new requirement that hospitals, clinics, and other sites that open the trial use the NCI’s Central Institutional Review Board to oversee trial changes. That move, the agency said, will speed the process of opening the trial at sites and registering patients. Lung-MAP’s trial is offered at more than 650 U.S. medical centers and community hospitals under the NCI’s National Clinical Trials Network (NCTN) and the NCI Community Oncology Research Program (NCORP)—a model designed to be more flexible, and faster, than traditional clinical trial models. Lung-MAP uses a single “master protocol” that is amended as drugs enter and exit the trial, which according to the NCI makes the trial more efficient and cost-effective, allowing researchers to more quickly assess whether new drugs work. Joining the NCI and NCTN as partners in Lung-MAP are SWOG Cancer Research Network; Friends of Cancer Research; the Foundation for the National Institutes of Health (FNIH); Foundation Medicine; several lung cancer advocacy organizations; and several pharmaceutical companies that provided their drugs for the study. Since its launch in June 2014, Lung-MAP has registered more than 1,700 patients nationwide. Trial leaders have worked with 10 pharmaceutical partners, in coordination with the FNIH, to launch nine studies, six of which are completed. The lung cancer advocacy organizations are Addario Lung Cancer Foundation, Lung Cancer Alliance, LUNGevity Foundation, Lung Cancer Foundation of America, the American Lung Association, the Lung Cancer Research Foundation, and the American Cancer Society. Participating biopharmas include Amgen; AstraZeneca and its MedImmune subsidiary; Eli Lilly; Genentech, a member of the Roche Group; Merck & Co., and Pfizer.